Like Star Wars fans everywhere, I was very excited for “Force Friday” on September 4th. In addition to toys and other merchandise, I eagerly awaited the new books coming out that day. I found out that several of the authors of Star Wars: Absolutely Everything You Need to Know would be at my local independent bookstore Mysterious Galaxy for the midnight unveiling. This made my decision to attend an easy one indeed. As it turns out, the hosts of Skywalking Through Neverland (Rich and Sarah) were set to host the event, which was an added bonus. Several of us used Twitter to coordinate a pre-event dinner, including authors Adam Bray and Cole Horton, at the café across the parking lot from the bookstore. I pretended that my kebab was nerf steak, of course. Afterwards, the nine of us made our way to the bookstore, encountering several 501st Legion, Rebel Legion, and R2-D2 Builders Club members preparing their costumes (and the always-helpful Artoo). A genuine air of excitement and friendship, shared through our love of Star Wars, permeated the entire affair. Adam Bray, Cole Horton, and Michael Kogge were in attendance for Star Wars: Absolutely Everything You Need to Know, and Cecil Castellucci promoted her new book Moving Target: A Princess Leia Adventure. Sarah and Rich performed perfectly as masters of ceremony and the authors shared fantastic information about their research and their elation about being part of the new book line. Finally, the staff and patrons counted down the last few seconds until midnight. Credit cards were presented with all the practiced efficiency of Jedi drawing their lightsabers, and we all excitedly dove into the book. I read Star Wars: Absolutely Everything You Need to Know over the next few days. Suffice to say that if you want to prepare for a Star Wars trivia night, or stump your friends with hard questions about the galaxy far, far away, this is the book for you. The time period ranges from the prequel trilogy to Star Wars: The Force Awakens and includes the Star Wars: The Clone Wars and Star Wars Rebels animated series. Jedi, Sith, rebels, clones, scoundrels, beasts, droids, and vehicles are all represented. Whatever it is that you like about the saga, you will find it here. The information from the publisher in the inside back cover says that some of the facts are taken from the Expanded Universe (the term that they used, rather than Legends). However, from what I can see, this really only applies to small details about canon characters/events. The book does not canonize Legends; there are no descriptions of Darth Bane’s early life as a miner or Mara Jade’s work as the Emperor’s Hand, for example. While there are a few pages devoted to Star Wars: The Force Awakens, there are no spoilers. All of the characters shown in the book have already been revealed to the public. No plotlines or quotes from the movie are present, so have no fear. The infographic format of the entire book means that there are plenty of beautiful pictures from the movies and cartoons. My 3 ½ year old son saw me reading and immediately climbed up into my lap. This, for me, is a definite plus – a book that both of us could enjoy. He found pictures of his favorites – R2, Yoda, Chewbacca, and the Ghost crew, mainly – and asked me to read the captions. Together, as father and son, we ruled the couch. This made my Sunday! This book is a great way to introduce younger kids to the characters and themes if you are looking to limit “screen time” or exposure to violence, as I am with my son. Regardless of your previous knowledge, I am confident that even the trivia experts will learn something new with this book. 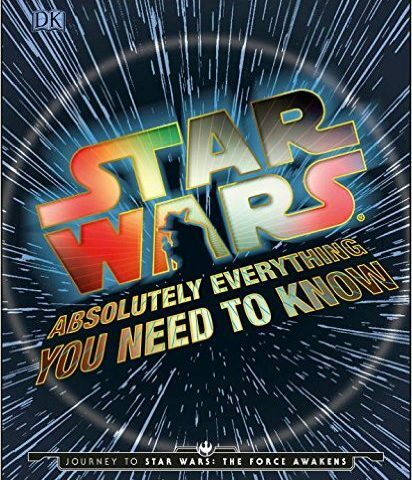 As mentioned, it’s also a great way to share the love of fandom with beginners; the coffee-table nature of Star Wars: Absolutely Everything You Need to Know makes it hard to ignore and easy to flip through and enjoy. The care and work that the authors have put into it are evident on every page. Highly recommended. By the way, post-event festivities included 1:00 AM Toys R Us and Wal-Mart runs with the authors… but unfortunately they did not have the droids we were looking for. All of the merchandise had been sold out by the time we departed the bookstore. Still, we had books in hand and had been able to spend the evening with fellow Star Wars fans! Images courtesy of Amazon – you can buy the book here.